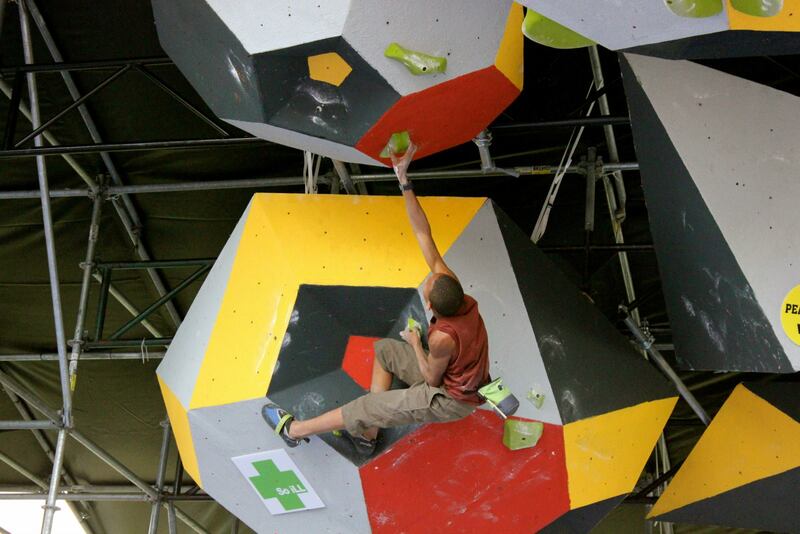 ← Climbing Competitions: How Do You Decide Who Wins? I’ve been meaning to do a Dominion RiverRock (DRR) recap post all week, but was so much in shock from the awesomeness that I haven’t regained the power of speech quite yet. (Okay, that’s a lie. But it was pretty awesome.) Fortunately, many of the athletes from the Boulder Bash have been doing their own recaps. Third-place finisher Sierra Blair-Coyle wrote about her experience, and local-ish (he’s from North Carolina) climber Kai Lightner kindly offered to allow us to republish his own impressions from the event. Kai’s post also appears on Prana’s website and his own blog. 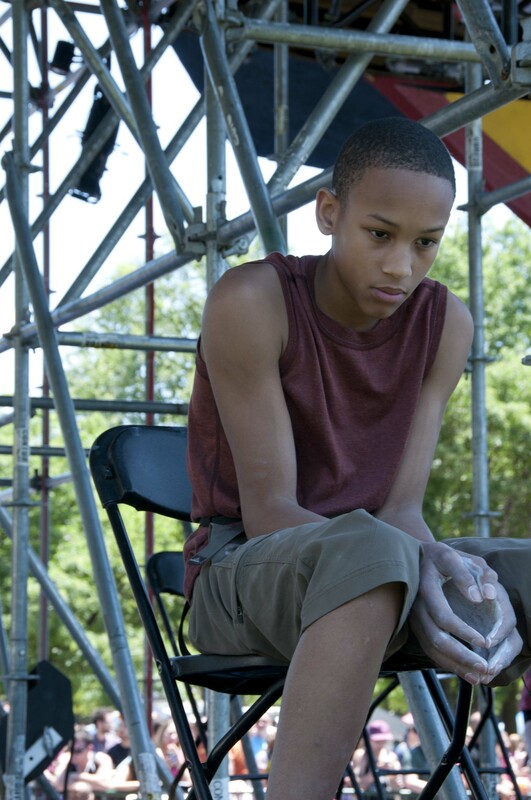 Kai’s recap of the event takes you inside the heads of one of the youngest competitors on the pro climbing circuit, and reminds us that as much as Kai and his peers crush on the wall, they’re only human; he falls sometimes, just like us! 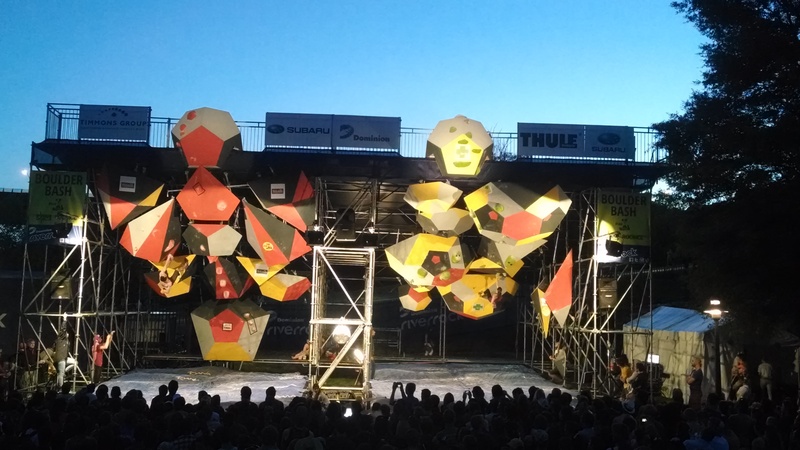 At DRR, the Boulder Bash and speed bouldering competitions were held inside of a huge 25-30 foot tall metal cage structure. Large volumes were attached to the metal beams, with climbing holds attached to the volumes. Climbers started on the ground towards the back of the cage and had to maneuver from volume to volume following a steep path up to the finish hold— 25 feet high. Climbers that reach the finish hold can top out and take the stairs back down to the ground. Everyone else had to take the big fall down to a 2 foot padding system below. I can honestly say, that I fell so much last weekend that I could probably do a product review for the padding company!! The Boulder Bash cages at twilight. Photo: Erin Barclay. The 2nd qualifier round was Saturday morning. Qualifier 2 was a longer route type boulder problem. I was much happier when I previewed this problem. The beginning of the problem was weird. It started on a slab and you were supposed to pressure your foot and throw for a crimp with your left hand. I tried that move multiple times, but couldn’t make it. I decided to change up a little and throw for the crimp with my right hand, instead of left, and I made it. I had to match the crimp in order to get back in sequence. I later found out that many people were unable to complete the starting move! After reaching the crimp, I had to quickly smear my hand on the next volume and balance my way over to a pair of positive slopers. After a series of power technical moves, I worked my way up to the last volume on the problem. The volume was positioned upside down and as I was climbing the volume (like a roof), I got confused trying to figure out where to put my feet, and I fell. I was proud of myself when I found out I had the 3rd high point and combined with my Q1 score, I had moved up to 7th to the semifinals round. There was a two hour break between the end of Qualifier 2 and the beginning of the semifinals round. The semifinals problem was another long route type problem. The route looked reasonable when I previewed it; however, when I actually climbed it, I quickly realized that the problem was much tougher than it looked. The beginning of the route was very bouldery. The first 10 moves had me eager to get to a resting spot. I was happy when I finally reached a decent sized jug and got a little rest. After a short rest, I continued through a few beta intensive moves, and then locked off to reach a really crappy side pull hold. At this point, I flagged one of my feet, locked off and reached up to a pinch on the next volume above. I had a firm grip on the pinch …………..….. and then I don’t know what happened!?! My hand just opened up and let go. I guess my muscles were tired?!? I was only midway through the problem when I fell, so I wasn’t very confident that I had done enough to make it to finals. I was really surprised when I found out that I was moving on to finals in 4th place. There was a two hour break between semifinals and finals. The finals problem started very bouldery. It began with a series of odd slopers, followed by a few powerful moves. Overall, the problem didn’t look that bad, but the sloper start had me a little worried. When I came out to climb I began up the starting slopers, but could not figure out how to maneuver them. I kept falling. I tried several different methods, including a foot first sequence, but I could not figure out how to use the holds correctly. I began to get frustrated with each failed attempt. When I finally figured out the beta, which was much simpler than I was making it, I made a stupid foot mistake and fell. My time was almost gone, and I was really disappointed that it took me so long to figure out the correct sequence. I had slipped back to 8th place to end the competition. Vasya Vorotnikov and Meagan Martin put on an awesome show and walked away with the wins! After a long day of competition rounds, I was glad to go back to the hotel and rest. 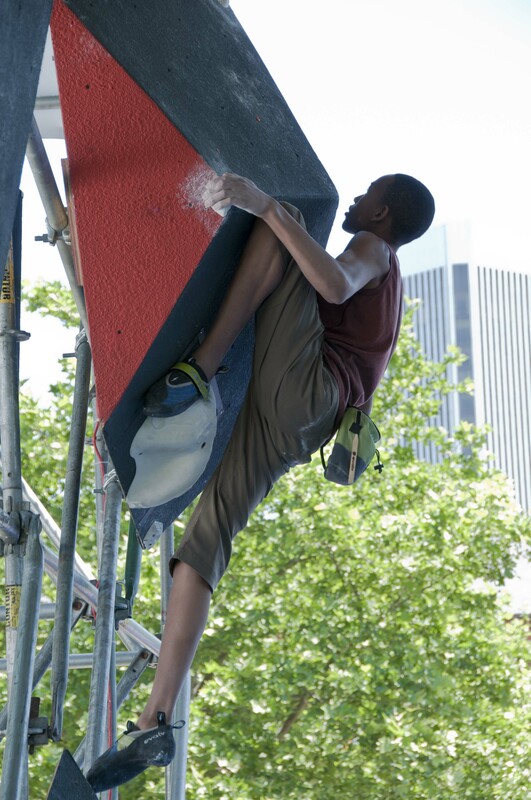 The speed bouldering competition was on Sunday. There were 2 qualifier routes that we were allowed to practice that morning. As I practiced the qualifying problems, I realized I could reduce my time by campusing a few moves on the route. We were told that we would climb each route twice and our lowest time would be recorded on each route. The top 4 climbers with the lowest combined qualifying times would move on to finals. My two runs on the first qualifier problems went as planned and my lowest time put me in 5th going in to the 2nd qualifier problem. As the guys began to climb the 2nd qualifier problem, I noticed that they decided to campus the entire 15-20 move roof problem! They were flying through the air like Tarzan swinging through the jungle, making 360° campus dyno moves! They were cutting their time significantly using this method. When my turn came up, I did the only thing that came to mind at the moment. I jumped up on the problem and began doing my own Tarzan impersonation and campused the route, 360° moves and all! I was proud of myself for being able to pull off some of those moves. When I came down off the route, my arms tingled a little as I returned to the line for my 2nd cut my time even lower. When I came off of the problem the 2nd time, my arms felt like they were on fire!!!!!!!! At first I didn’t understand why, but as I thought about it, the reason was obvious. I’m a sport climber. I’ve been trained to use my feet efficiently and minimize pulling with my arms. And although my Tarzan experience was FUN, I quickly realized that my arms weren’t as excited about my adventure. They needed a few days to recover……….. I ended the speed competition in 6th place. Ultimately, Josh Levin, and Meagan Martin came out with the win! 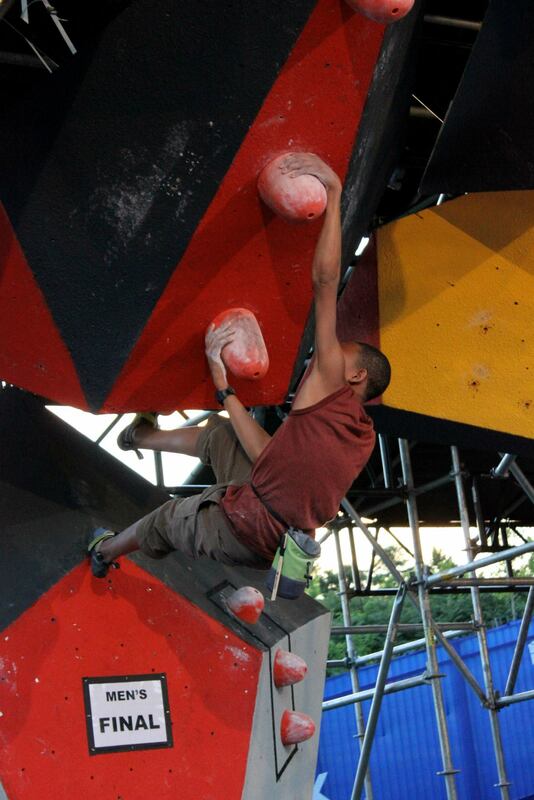 I’ve competed in A LOT of climbing competitions, but Dominion River rock was unlike anything I have ever done before. I had a blast competing this year, and I look forward to next year’s comp! Kai lives in Fayetteville, NC, but spends his time touring the country crushing comps, premiering documentaries, and being an all-around cool guy. We’re always stoked to have Kai in town for training or comps. Keep up with him on his blog. This entry was posted in Competition, Events and tagged competition, Guest Post, RiverRock, RVA. Bookmark the permalink.